The deadliest Ebola epidemic on record has now infected almost 6,000 people in west Africa and killed nearly half of them, according to the World Health Organization's latest figures. In the update, released late on Monday, the UN health agency said a total of 5,864 people had been infected across five west African countries, and that 2,811 had died. In Guinea, where the outbreak began late last year, Ebola had as of September 20 infected 1,008 people, killing 632 of them. A third of those cases surfaced in the three weeks leading up to September 14. In Liberia, which has been hit hardest by the outbreak, 3,022 people had been infected with Ebola, and 1,578 of them had died, as of September 17. 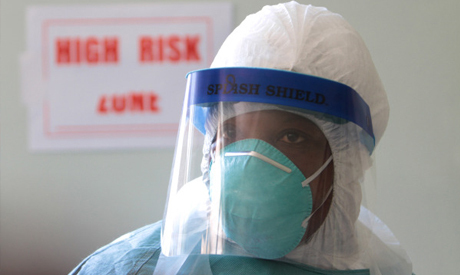 In Sierra Leone, Ebola had as of September 19 infected 1,813 people, killing 593 of them. Nigeria had, as of September 20, recorded 20 cases, including eight deaths, since Ebola first arrived in the country with a Liberian finance ministry official, who died in Lagos on July 25. Senegal's only confirmed Ebola case -- a Guinean student who crossed the border just before it was closed on August 21 -- has recovered, but the country will not be declared free of the virus until 42 days after the case was recorded. Healthcare workers, already in very short supply in the impoverished countries hardest-hit by the outbreak, have paid an especially heavy price. As of September 22, 348 of them had been infected across four west African countries and 186 had died. Liberia: 174 healthcare workers infected, 85 of whom have died. Sierra Leone: 96 healthcare workers infected, 61 of whom have died. The Democratic Republic of Congo has meanwhile been hit by a separate Ebola outbreak, which had killed 40 people out of 71 cases as of September 15. That species caused the world's first known Ebola outbreak in DR Congo in 1976, which until now was the deadliest on record, with 280 deaths. The current DR Congo outbreak meanwhile is believed to come from two separate species, the Zaire and the Sudan, which first surfaced in Sudan in 1976.